Alpha Version 1.3 for 1.7.2 forge is released! -added Diver suit armor. makes you sink to the ocean floor & give lots of extra breathing time when wearing full set. the bugfix alpha version 1.2 for Minecraft version 1.6.4(Forge) has been release with a few new features. added small crabs, tuna, and sailfish! also you can now catch squids with your net and release them whenever you want! we also added a new color variation for the lobsters, so you can now find black lobsters. we FINNALLY release the alpha version 1.1! we added a couple coral blocks and plants, added coral reefgeneration and kelp forests into the ocean biomes! we also added a generated structure in vilages, a new villager, and a handful of new mobs! 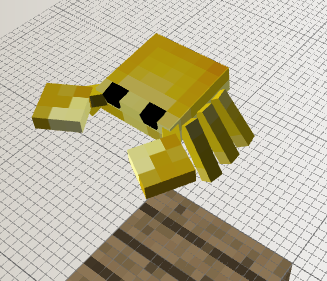 the new mobs include: clams, starfish, lobsters and 3 types of new fish! there's the mossyback bottom feeders, spotted bottom feeders, and salmon! we also added the goggles to help people fully apriciate the new changes to the oceans. we also reworked the ai for the fish so they'd work the way we intended in the 1st update(they were very glitchy) we also added 5 new types of food! raw and cooked lobster claws and lobster tails. we also added sushi! the bugfix alpha version 1.2 for Minecraft version 1.7.2(Forge) has been release with a few new features. added small crabs, tuna, and sailfish! also you can now catch squids with your net and release them whenever you want! we also added a new color variation for the lobsters, so you can now find black lobsters. lots of things have happened since i last updated this post. we've recruited a new coder, Frag2000, who has basically re-created the mod from scratch, and has taken leadership of the mod's development. we also created a shared MCforums account for the dev team to make posts and to use to post a new thread for the mod. once we FINALLY post and update version of the mod we will be removing most information on this thread and adding a link to the new one. The fish are able to detect a floating lure in the water when its within a specific radius and height depending on the type of fish, and will slowly swim towards it and once they get close enough they dart at it and get "hooked". Once they're hooked all other fish will avoid the lure and hooked fish and flee from it. The hooked fish will start to berserk and swim around erratically like a peaceful mob that has been attacked. To "catch" the fish once its hooked simply right click to pull it on land. After a set time of being hooked, depending on the fish, a fish will start to swim downwards making it harder to pull out of the water. Once its on land it will begin to flop around on its side like a real fish bouncing around until it is killed or lands back into the water. To get the fish in item form you left click it with a "net" which will despawn the fish and give you the fish item that can be used to re-spawn the fish. This means chasing down fish with the net is a valid fishing method assuming you can get close enough. Fish also avoids players keeping their distance by darting extra quick, so the player can't simply swim after them and hit them with a sword. Coral reefs and kelp forests have been added! dispite being called kelp forests, theyre mostly made of seaweed, and only a small amount of kelp. spawns rarely in villages with 2 fantastic fishermen(new vilagers)the fisherman trades in "pearls" for various mod related items. he also buys legendary fish for large amounts of emeralds! i would rather somebody attempt to contact mojang about my idea and sending them these pictures than to have them put into a mod honestly. so if you or anyone could attempt to do that on my behalf i would be very greatful! here is a top view of one of the fish in case anyone is interested. Maybe you could suggest those to Mo Creatures. Half of the work seems to be made for your fishes. All that's missing is a good coder, sounds and drops. The fishes in Mo Creatures all have that creepy smile and just change colors to differentiate between themselves. Well, they could live in deeper water and they wouldn't have to replace the small fishes. They would just add more variety. And it also means more type of fish to cook. thats exactly what i was thinking soriel. however i really need to better organize this topic so that its a little easier to read through without getting confused because of information that was overlooked or left out. if someone would partner with me on this idea who is a modder and could help me organize, i think this mod could make a lot of progress very quickly. I'm no modder (unfortunately, I'm just one of those that can solve almost any block ID conflict and mod install problems), but I do know that this could become good material. If there's any experienced modder who would look at this thread and say ''Just another mobs mod'', please consider this idea as a way to get a good look at one of the major mods like Mo Creatures. I don't promise you that you will work with Dr Zark, but this might get you to help him. im a very laid back type of person who just likes making things look cool. to help get this topic organized i just need someone can reformat my topic in an easy to read through way. i would also prefer who's willing to take over advertizing and trying to find a modder who will code this so i can focus on model making, textureing, and coming up with ideas for how it should all work. So, you are a texturer, you need someone that makes organised thread and that can advertise your skins to modders. that's basically it. but i make models too and at least i think i have good ideas of how things should work, for example the way i said fishing should work. i'll pm you a download link once ive uploaded it somewhere where u can download it. please vote on poll, and please forgive me for double posting as much as i have. i don't want it to get lost in the sea of topics!